1) This clear dome is double layers and air tighted, so no need to use blower to keep continous air. 2) You can use it as a small meeting room, or use it as resting room during the party. 3) It's really a good idea to drink coffee inside a clear bubble tent. you can have a very good sight for everything around you. 4) As if you want to use it at the night, yes, when light up, the whole tent would just like a crystall ball, and which it's a colorful, huge crystall ball. 5) It's very easy to move from one place to another place, and as it's air tighted, when in rainy days, you can also have a very good experience with the dome. because it's 100% water proof. 6) This tent is with a ground sheet. 7) Can be printed with client's single color logo printing on it. This trasparent inflatable dome tent are widely placed in all kinds of outdoor party events and also for opening ceremonies, promotion activities, displaying shows, sports arenas, warehouses, stores etc; they will bring people much visional impact. As it is transparenet PVC, People in the dome can have a clear vision for outside Scenery . It is also very popular to exhibition. 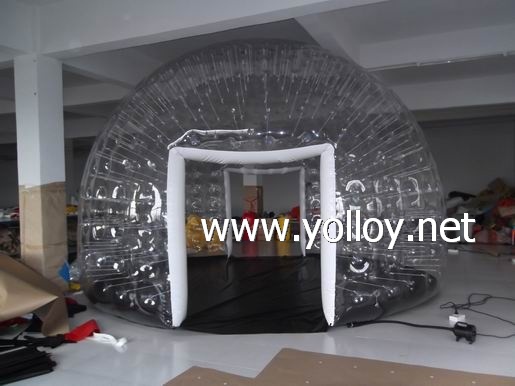 please contact us for more details for this bubble tent.